The anniversary of President Trump’s inauguration is Saturday, and he is ending his first year on an upswing. 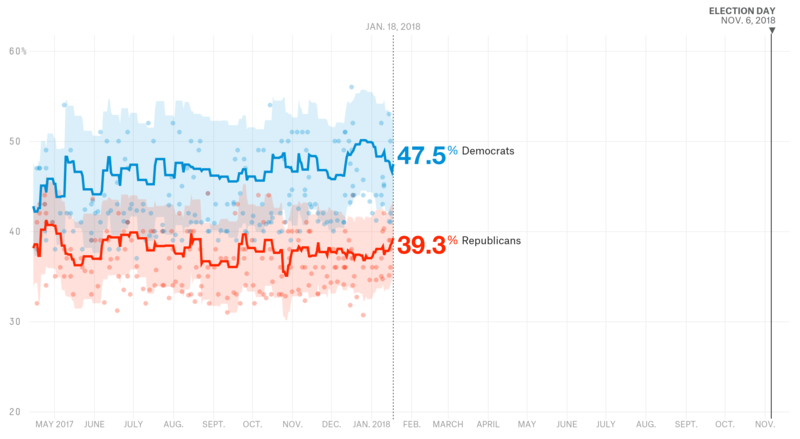 The FiveThirtyEight Trump job approval tracker puts his approval rating at about 40 percent — matching its high-water mark since his first few months in office. His disapproval rating is 55 percent.1 That’s not good, but it has markedly improved over the past few weeks. Trump’s rise mirrors GOP fortunes on the generic congressional ballot, which now has the Democrats’ lead down to 8 percentage points. Again, that’s not a good number for Republicans, but it is greatly improved. All of that doesn’t mean that Republicans can suddenly exhale and relax about the coming midterm elections. Those still look like they’ll be very good for Democrats. But if Trump’s approval rating were to continue to improve, it could help mitigate GOP losses — and maybe save the Republican majorities in the House and Senate. So now that we’re one year into the Trump era, let’s take a step back and put Trump’s approval rating in a historical context. Based on approval ratings one year into a first term, Trump is the most unpopular president since at least Harry Truman (as far back as we have data). Trump’s approval rating is 22 percentage points lower than the average modern president’s. Meanwhile, his net approval rating (approval rating minus disapproval rating), -15 percentage points, makes him the only president in negative territory one year through his first term. Trump’s closest precedent is Gerald Ford, who had a net approval rating of just +5 points one year in. Of course, Trump’s historical unpopularity has been true for a while. His approval rating started in the mid-40s (still his high-water mark), dropped as low as the mid-30s, and has rebounded to somewhere in between. He’s abnormally unpopular for a first-year president, but the movement in his approval rating has been pretty normal. Back in July (about six months into his presidency), Trump was an unpopular president whose approval rating had experienced an average drop from the term’s beginning to its halfway mark. That’s still true: Trump is an unpopular president whose approval rating has moved a roughly average amount from the halfway mark of his term to now. Excluding Trump, the average president since Truman saw his approval rating rise by less than a point from halfway into his first year through the end of it. 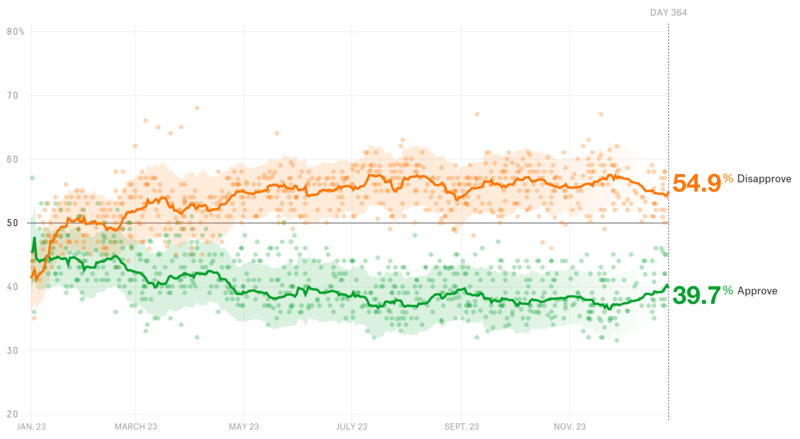 Now, you might ask, “Why hasn’t Trump’s job approval rating dropped more?” After all, a lot what’s coming out of the White House is negative (at least if you judge it by the news coverage). For one, there are factors exerting upward pressures on Trump’s rating — important ones. The economy, for example, is doing quite well by most measures. In fact, it’s notable that Trump is as unpopular in this economic environment. Secondly, presidents’ approval ratings tend to revert toward 50 percent over the long term. Given that Trump started his term with an approval rating that was below 50 percent, there might be a natural force pulling his rating up. The two presidents who had approval ratings below 50 percent halfway through their first year in office (Ford and Bill Clinton) each saw at least 9-point increases by the end of that year. Meanwhile, the presidents who had an approval rating of 50 percent or higher halfway through their first year in office suffered, on average, a 1 point decline. Those with an approval rating of 60 percent or higher halfway through their first year in office suffered, on average, a decline of 4 points. No matter how you look at it, the verdict one year into Trump’s tenure remains the same as it was halfway in: He is an unusually unpopular president who is doing worse than you’d expect based on the presidencies that preceded his. The big question is whether the recent climb in Trump’s approval rating will continue. Maybe his popularity will start tracking more closely with where the strong economy suggests it should be. Or maybe the recent upswing for Trump and Republicans is merely a blip and his approval rating will drop back into the mid-30s. The midterms — and control of Congress — could be riding on the answer. Programming note: Some readers have asked whether Gallup’s switch to a weekly tracking poll, instead of daily, has affected our job approval rating aggregate. It hasn’t. The aggregate adjusts survey results for each pollster’s “house effect,” which prevents any single firm from skewing the average. A Civis Analytics survey shared exclusively with FiveThirtyEight shows Oprah Winfrey in third place in a potential 2020 Democratic presidential primary with 17 percent of the vote. She trails Joe Biden (29 percent) and Bernie Sanders (27 percent). In a hypothetical general election matchup, Winfrey leads Trump by a 7 points; Biden and Sanders lead Trump by 11 and 13 points, respectively. A Gallup/Knight Foundation report finds that 45 percent of Americans believe there is “a great deal” of political bias in news coverage. That’s up from 25 percent in 1989. The share of Democrats who identify as liberal is up to 50 percent — the highest amount measured by Gallup since at least 2001. Overall, liberals now make up 26 percent of the population — the highest among since at least 1992. 68 percent of Americans believe special counsel Robert Mueller should be allowed to finish his investigation into Russian interference in the 2016 presidential election, according to a Marist College poll. Two new polls differ on how the Republican tax plan is playing with the public. SurveyMonkey has its net approval rating going from -21 percentage points in December to -3 points in January, while Gallup shows a much smaller improvement during the same period, from -27 points to -22 points. 55 percent of New York voters said they would vote to re-elect their governor, Andrew Cuomo, in the latest Siena College survey — his highest rating this cycle. Just 36 percent said they preferred someone else to be governor. Trump’s job approval rating among Muslims is 18 percent — the lowest number among all the religious groups surveyed by Gallup over the course of 2017. It was highest among Mormons, at 61 percent. Trump’s “recently reported comments on immigrants from certain countries” are believed to be racist by 58 percent of voters, according to a Quinnipiac University poll. 4 percent of Democrats and 16 percent of Republicans listed immigration as a top problem in the country in a recent Gallup poll. 57 percent of Americans told YouGov that they take their shoes off upon entering their home “always” or “most of the time,” but only 21 percent said they ask their guests to do so at the same frequency. Trump’s approval numbers in this article are as of 5 p.m. Thursday.